Introduction. 2. Methods of investigation. 3. The topography of the Great Sand Sea. 4. Results of the granulometric analysis. 5. Luminescence dating. 6. Quartz sand as indicator of humid periods. 7. Results of the heavy-mineral analysis. 8. The scanning-electron microscopy (SEM). 9. The history of the Great Sand Sea compared to that of other active ergs. 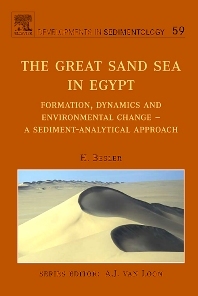 The Great Sand Sea in Egypt presents the history of one of the large sand seas in the Sahara, beginning with the sand supply by fluvial transport from partly distant areas and also by local sandstone weathering. It also details sand as carrier of information and shows the possibilities of sedimentary analysis in dealing with such a topic. Simple measurements may supply important information (e.g. salinity measurements). Well known methods can be developed further to answer special questions. A wealth of information can be drawn from especially adapted sedimentological investigations. In the end, bits of information from different analytical sources can be put together to reveal the history of a large sand sea.